In each of the Second Chance Drawings (up to five (5)) the Lottery will select: one (1) Touchdown Challenge Finalist, six (6) VIP Season Ticket Package winners, one (1) Away Game Trip Package winner, sixteen (16) Super Suite Ticket Package winners, forty-four (44) Game Day Ticket Package winners and one hundred (100) Merchandise Prize Pack winners. Touchdown Challenge Finalist, VIP Season Ticket Package, Away Game Trip Package, Super Suite Ticket Package and Game Day Ticket Package winners will be notified by the Lottery and must complete a claim form. TOUCHDOWN CHALLENGE FINALIST: One (1) Finalist will be chosen in each Second Chance Drawing. Each Finalist will receive $10,000 (less applicable taxes and withholdings). At the conclusion of the game, the Lottery will select one (1) Touchdown Challenge Winner from among the five (5) Touchdown Challenge Finalists. The Touchdown Challenge Winner will have the opportunity to win up to $250,000 (less applicable taxes, withholdings and prior payments) in an on-field presentation at halftime of a regular season Patriots home game. VIP SEASON TICKET PACKAGE: Each winner will receive: two (2) lower bowl season tickets, two (2) season long hospitality passes to the VIP Pre-Game Experience at the Cross Insurance Pavilion & Business Center, one (1) season long parking pass, and $250 in cash. 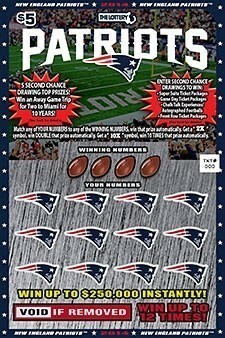 This package includes Patriots preseason and regular season home games only. Total prize value is $20,358 (less applicable taxes and withholdings). AWAY GAME TRIP PACKAGE: Each winner will receive: roundtrip airfare for two (2), ground transfers at destination between airport and hotel and to/from game, hotel accommodations for two (2) nights (double occupancy), two (2) game tickets for a Patriots regular season away game and $500 in cash. The winner will have the opportunity to pick one (1) of two (2) away game cities determined by the Patriots. Total trip prize value is $15,000 (less applicable taxes and withholdings). SUPER SUITE TICKET PACKAGE: Each winner will receive four (4) tickets to a Patriots regular season home game in a Gillette Stadium Super Suite, one (1) parking pass, food and beverage (alcohol not included) and $300 in cash. Total prize value is $4,790 (less applicable taxes and withholdings). GAME DAY TICKET PACKAGE: Each winner will receive two (2) tickets to a Patriots regular season home game in the Lower Level Corner/End Zone or Mezzanine Level Corner, two (2) pregame tailgate party passes, one (1) parking pass, one (1) $100 Stadium gift card, one (1) football autographed by a 2017-2018 Patriots starting player, two (2) patriots caps and $250 in cash. Total prize value is $1,628 (less applicable taxes and withholdings). MERCHANDISE PRIZE PACK: Each winner will receive one (1) authentic Patriots jersey, one (1) Patriots t-shirt, one (1) Patriots cap, one (1) Patriots knit hat and one (1) Patriots autographed mini helmet. Each estimated prize value is $595.